Dubai, UAE, August 09, 2018: The Mouawad Group has acquired the 51.38 carat Dynasty diamond, the largest and purest diamond in a collection of five stones offered for sale by ALROSA – a world leader in diamond mining. ALROSA unearthed the 179-carat rough diamond in 2015 at the Nyurbinskaya kimberlite pipe in the Republic of Sakha (Yakutia). The auction took place on August 2nd, 2018. The total Dynasty collection sold for US$ 10 million making it the most expensive stone sold in the miner’s history. 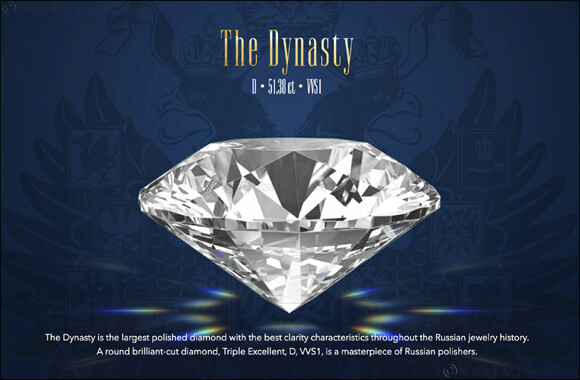 The impressive 51.38 carat Dynasty is a traditional round brilliant-cut diamond, D color, VVS1 clarity, which also makes it the best quality large diamond ever manufactured in Russia. Over the years, Mouawad has acquired a collection of exceptional diamonds such as, the 245.35 carat Jubilee Diamond, the 135.92 carat Queen of Holland diamond, the 69.42 carat Taylor Burton, and the largest cushion shaped D IF weighting 218.08 carat. The Mouawad Group has penetrated continents across the world, while retaining its eminent position as jeweler to royalty, high society and those that appreciate the finest standards of dazzling craftsmanship. Steeped in rich traditions and guided forward by its fourth generation, Mouawad is committed to continue its legacy for many more generations.